Well, hey, everyone! It's been a while (again), but this time it was due to computer trouble (farewell old macbook), taking a quick jewelry class, and starting a new internship back in New York for another summer. As quick as that month went, it's about to become a new one with the welcoming of July in a few days. With that, comes one of my favorite holidays: July 4th, of course! Now, the fourth of July is the epitome of summer celebrations. While the past two summers I've spent it watching fireworks off of The Hudson river in the city, this summer I'll be spending it in a different city, Hilton Head, South Carolina. When it comes to trips, I always get excited to pack and dress for that specific location. The four pieces above are ones I have been particularly drawn to as of late. 1. 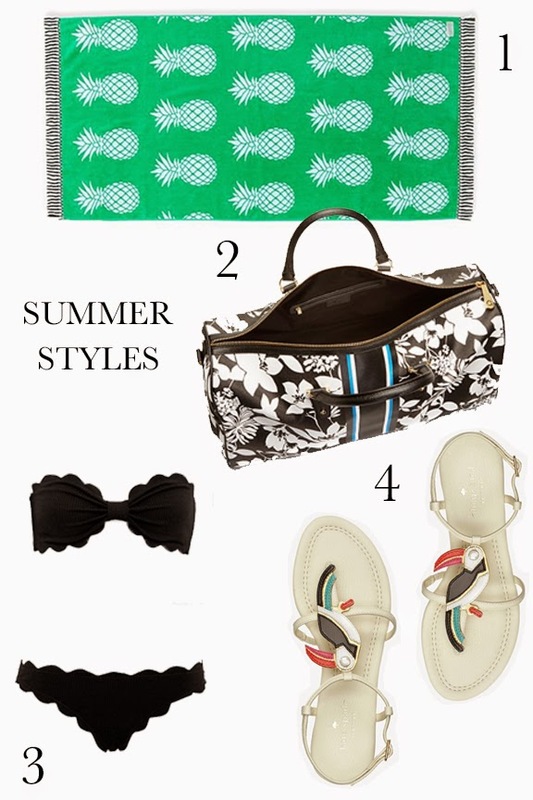 Pineapples, and fruit patterns alike, have been popping up everywhere this summer, and what better of a print to lounge on while at the beach. Not to mention, the bright green is festive, too! 2. I usually am terrible at packing, often somehow turning weekend getaways into weeklong ones with the amount I include in my suitcase. However, I recently purchased the duffle above at the incredible C. Wonder sale this past weekend. With it's black and white hawaiian print and my monogram in neon yellow that I added, it screams South Carolina and will hold up for all of those perfect little summer excursions and ones afterwards, as well. 3. I've been following the Marysia swimwear company for a while after seeing their sweetly scalloped suits on bloggers and Instagram feeds. There is something about their shape and style that seems so classic and stylish at the same time. 4. Finally, Kate Spade's month in Rio brought these toucan sandals. While I've never been to Rio, I have ventured into the Kate Spade store, I can vouch that these would look just as cute on the beaches of South Carolina as they would in Rio. Hope everyone had a great weekend, and here's looking forward to a short work week ahead!